Excellent location! Central and at the same time quiet. A walking distance to absolutely everywhere including the beach! Lovely apartment with nice minimal decoration, fully equipped. Comfortable spaces very clean and very bright! Great staff! I was impressed by the immediacy and the excellent service they provided! Bonus points for the parking space in the basement of the building!! No question, i will be back to Rhodes Central Suite! Location! Location! Location! Newly renovated. Selection of coffee machines. Each room had it's own Air conditioning. Very clean and comfortable. Very good location, at the center of Rhodes Town. Everything you need is 5mins walk tops. Case you are not the walking type or want to go bit further and are worried about parking (its city center so yeah it can happen) there is parking area in the basement of the building where you can have a spot reserved for you. Leave your car there and just get the elevator to your suite. Which is btw brand new as well as everything inside. Very well equipped, with anything more you might need provided by the very friendly and helpful Helen (thank you for the extra-extra towels that day ) and Anastasia (I understand its high season so really appreciate the late checkout). All in all, really satisfied, hoping it will be available for my next visit. 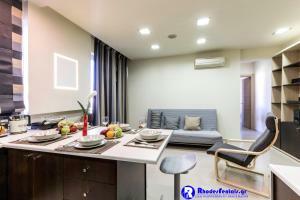 An elegant apartment with attractive design, with full and brand new equipment. Excellent linen, very clean and with delightful ambience..Located in the heart of the city center, at walking distance to everywhere..to posh restaurants, bars, shops, museums and of course the beach...Also being a lite sleeper the apartment is located in a very quiet building..Extra bonus for the security door!! Staff is kind, respectful and friendly...will definitely be back..
시내에 위치해서 편리했고 시설도 좋고 모던하며 전망도 좋아요. 웰컴 와인 2병과 과일바구니도 챙겨주어 잘 먹었습니다. 편안했어요! Lock in a great price for Rhodes Central Suite – rated 9.8 by recent guests! Rhodes Central Suite is located in Rhodes, a 10-minute walk from Clock Tower, half a mile from Grand Master's Palace, and an 11-minute walk from The Street of Knights. Guests staying at this apartment can use the free WiFi. The air-conditioned apartment consists of 2 separate bedrooms, 1 bathroom with a hair dryer, a seating area area, and a living room. The kitchen features a dishwasher, an oven and a microwave, as well as a coffee machine and an electric tea pot. Mandraki Port is 0.7 miles from the apartment. Diagoras Airport is 9 miles away. 뀐 Located in the top-rated area in Rhodes, this property has an excellent location score of 9.7! When would you like to stay at Rhodes Central Suite? House Rules Rhodes Central Suite takes special requests – add in the next step! Rhodes Central Suite accepts these cards and reserves the right to temporarily hold an amount prior to arrival. Please inform Rhodes Central Suite of your expected arrival time in advance. You can use the Special Requests box when booking, or contact the property directly using the contact details in your confirmation.